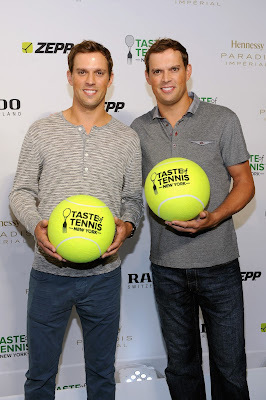 John Isner and Juan Santamaria at the Measure Lounge station at the Taste of Tennis. Photo by Yours Truly. HEADS UP: Once again, it is the week (roughly Tuesday through Saturday) leading up to the U.S. Open. At VEVLYN’S PEN, we call it U.S. Open Tennis Week. Before the players get down to serious business, they do a little lightweight partying. Stay tuned, as we bring some of the action to you. JOHN Isner was the belle of the ball. Serena Williams relinquished that title when she went as soon as she came. Everywhere the highest ranking U.S. male tennis player went, he was trailed and swarmed by an adoring public literally looking up at his 6’10” self. He took it all in stride. It was one of several stories at the Taste of Tennis gala last night where JI helped serve Sesame Crusted Fried Camembert and Smoked Salmon with Shallot Jam from chef David Vandenabeele’s Measure Lounge. 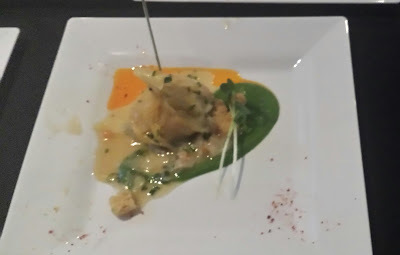 Elsewhere, that other Williams Woman took culinary cues from Marc Murphy. And seen just hanging out: Jo-Wilfried Tsonga, Eugenie Bouchard and Gael Monfils. Arriving late, shy and gentle Ivo Karlovic, the man with more aces to his name than anyone else. 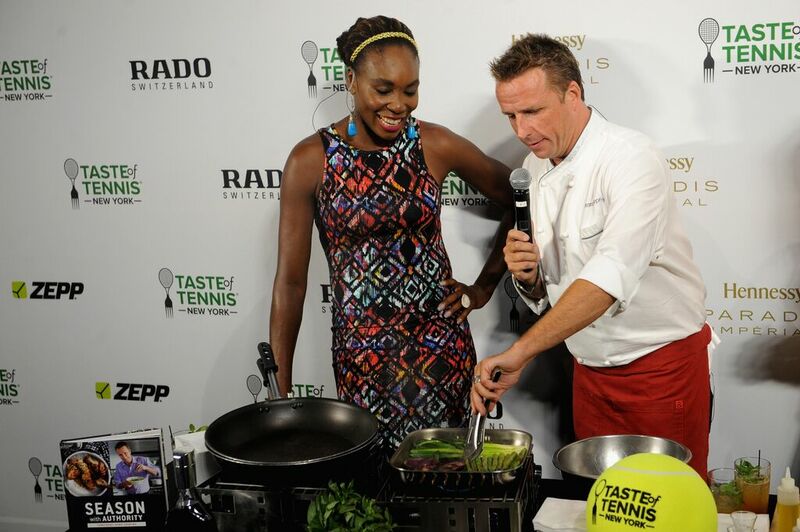 Venus Williams appears to be paying attention as Marc Murphy demonstrates how to move asparagus around the pan. Photo by Getty Images for AYS. 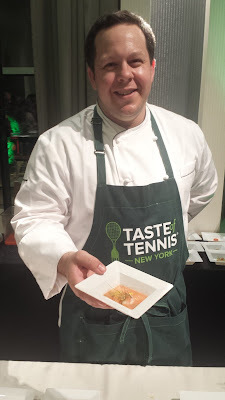 Visit http://www.tasteoftennis.com to learn more about the Taste of Tennis. 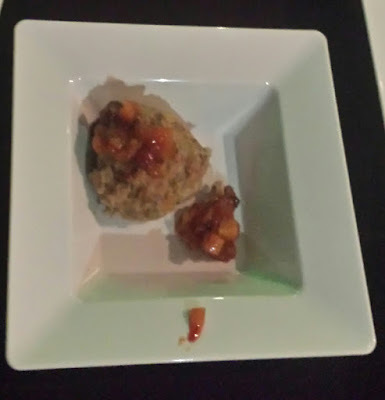 Jerk Chicken Balls with Mango Chutney found a friend in Yelena Jankovic who helped chefs Daniel Holzman and Michael Chernow (The Meatball Shop) serve them up. Photo by Yours Truly. Chef Eric Gabrynowicz (Restaurant North) shows off his Poached Gulf Shrimp w/Fennel, Tapioca and Tomato Broth, while Yelena Jankovic shows off her new haircut and hair color. Photos by Yours Truly and Getty Images for AYS. Chris Shea from The Wayfarer set out chicken and Dumplings. Photo by Yours Truly. Taste of Tennis co-hosts the Bryan Brothers said they hope to come to the event next year with gold medals, a repeat of 2012. Meanwhile, Eugenia Bouchard has a golden spot in her heart for one certain dish. Photos by Getty Images for AYS.